French Dip Reviews: 2 of 5 DeliciScore™ (Not Quite There) Awarded to Matts’ Rotisserie & Oyster Lounge for their French Dip Sandwich in Redmond, WA on this 11th day of January, 2012 - Give me a break. 2 of 5 DeliciScore™ (Not Quite There) Awarded to Matts’ Rotisserie & Oyster Lounge for their French Dip Sandwich in Redmond, WA on this 11th day of January, 2012 - Give me a break. 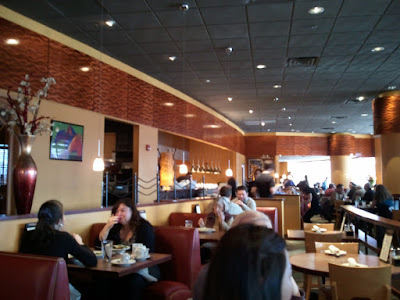 Went out to lunch with some coworker friends, Joel and Leo, today. 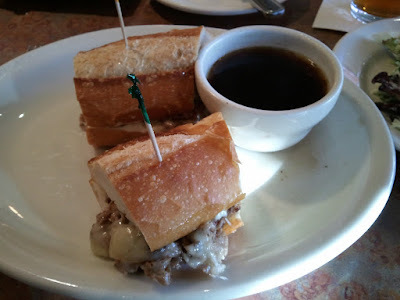 Went to Matt's Rotisserie at Redmond Town Center because I hadn't had their French dip yet and was able to talk my guys into sitting through the review with me. The view from our table. They originally sat us by the door, where this picture was taken, on a 35 degree day and we asked to be seated elsewhere away from the draft during busy lunchtime, which they promptly obliged. Matt's is a nice little spot with a good vibe at Redmond Town Center. I've been here for drinks and happy hour countless times and have had a lot of good times here. They have good cocktails, wait staff, bartenders, and oysters. French Dip: Applewood rotisserie beef, sauteed red onion, swiss (forgot to capitalize) cheese and horseradish mayo on a sourdough roll with au jus for dipping. Half $9 ~ Whole ~14. I got the Whole based on the recommendation from the waitress that "she always gets the Whole". Waitress said that it all comes "Medium well" and that it's the same beef product that they use for their tacos. I was immediately not impressed. I wondered if it would taste like taco meat, for example!!! This sandwich is "fully loaded" (added this new term to the glossary): it has mayo, onions, Swiss cheese, and sourdough bread. Due to the sourdough, and fancy toppings I would also refer to this sandwich as "gourmet". The price for the whole (which wasn't all that huge of a sandwich, it turns out) is $14, pricey for non-Prime Rib. They provide good, soft, salty, nicely-textured bread and butter as a free appetizer, which was a nice touch. 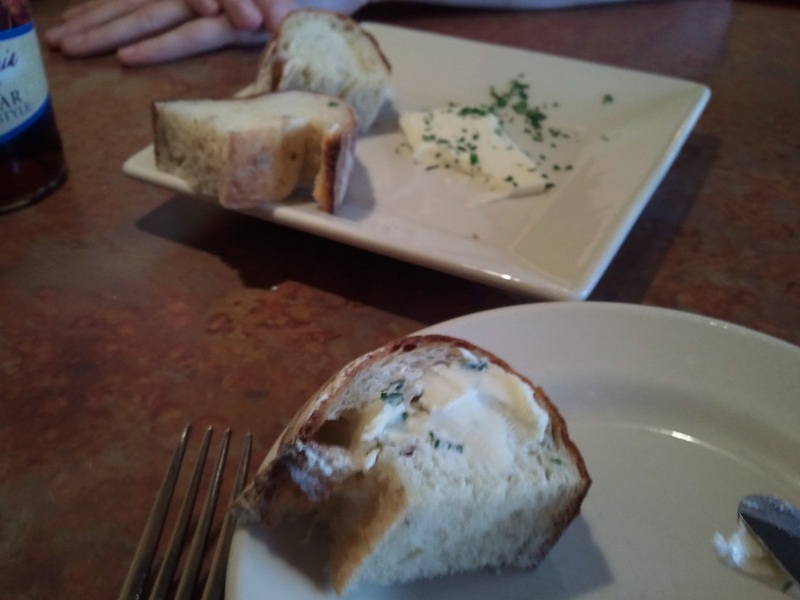 The bread and butter appetizer, which comes with all meals. Great, fresh, soft bread and good butter. The salad was ok-looking at first glance but the lettuce was pretty white and "pithy" (Leo's word). 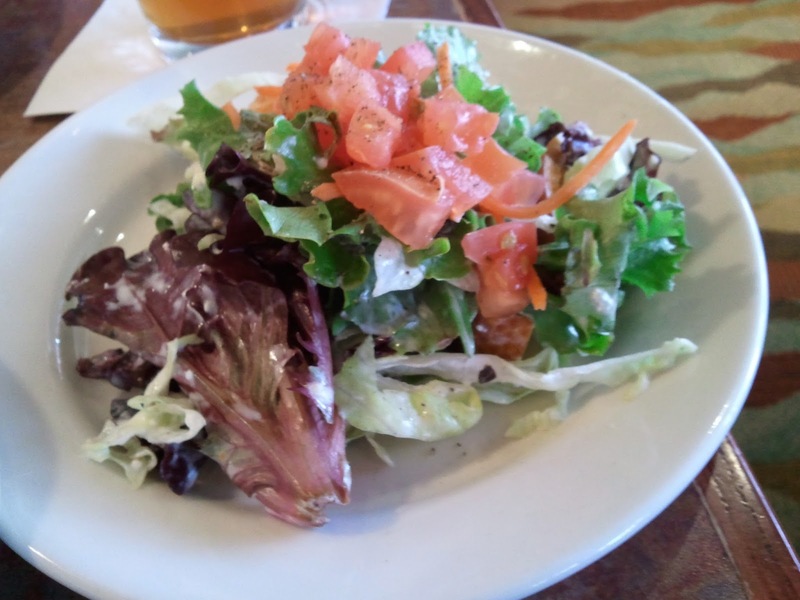 We were fairly critical of this salad and I decided not to eat it. The greens look nearly fancy but I think they seemed old and didn't look all that fresh. Flacid, aged. Bad. Although a nice touch, their pepper mill was more like a pepper SHOWER that blasted pepper out at a wildly rapid rate. If you weren't careful, you got way too much pepper on your food. So, be ready to say "that's enough"!!! ...Joel stammered and wound up with a ton on his salad. 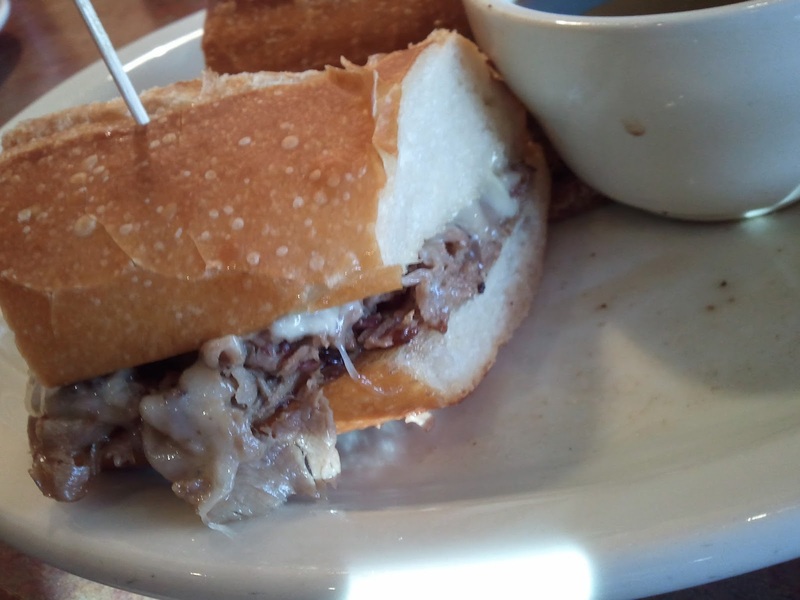 The French dip, plated. Good looking overall with the exception of the meat. You can see the melted cheese. The ratio of meat to bread was too much bread. Fancy toothpicks. The gray color of the meat and the out of whack ratio of meat to bread was off-putting and I immediately got a negative vibe. The au jus was steaming when it came out, which is always important but the taste of it overall was ho-hum due to the the too-powerful flavor of the sourdough and horseradish. Jus Score = 3. 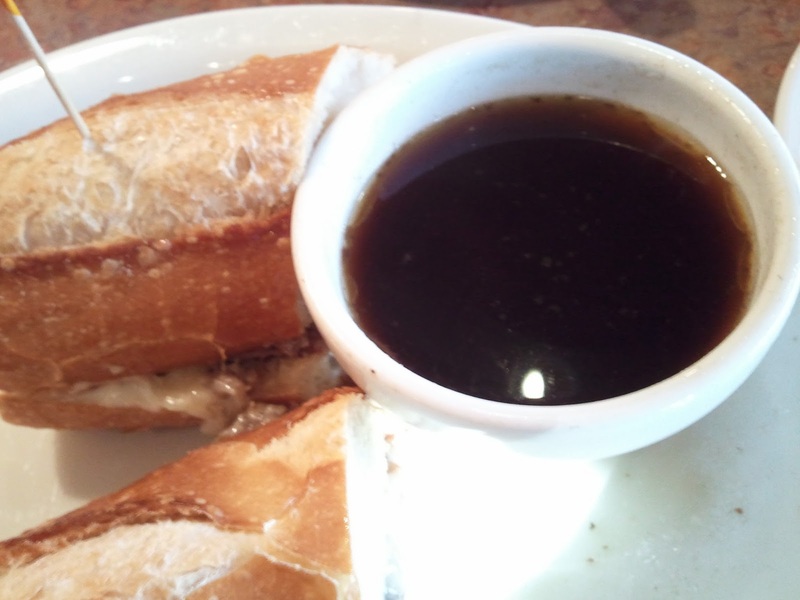 The au jus: dark, steaming on arrival, had enough for the dense bread. The bread looked really good: it was a nice, fancy golden brown color with little bubbles in it, perhaps a shimmer of being brushed with oil or butter. It came skewered with fancy toothpicks. The taste of the bread on the other hand was way too much for what should be a delicate sandwich. The sourdough really made the sandwich taste sour and not all that good. In fact, the overwhelming flavor of this sandwich is SOUR between the sourdough bread and horseradish mayo. Fail. Bread Score = 2. The sandwich, which you can see isn't overly meaty with a lot of pretty dense bread. There was enough au jus provided. The meat by itself was fine. It was good and crunchy, kind of chewy meat that seemed, if a bit greasy, probably from the cheese and mayo on it. It's color was grayish brown and I wished that there was more of it ratio-wise (or less bread) and that it could be provided medium-rare. Meat Score = 2. The horseradish mayo on this thing wasn't any good. It tasted sour. The grilled red onions were useless and not all that tasty. The Swiss cheese also added nothing but grease. Non-Meat Topping Score = - 4. The horseradish and bread made it sour and the cheese and mayo made it greasy. No one wants a sour, greasy sandwich; Joel only ate half of his and sent the rest back. There was too much bread and not enough meat. The au jus was fine. 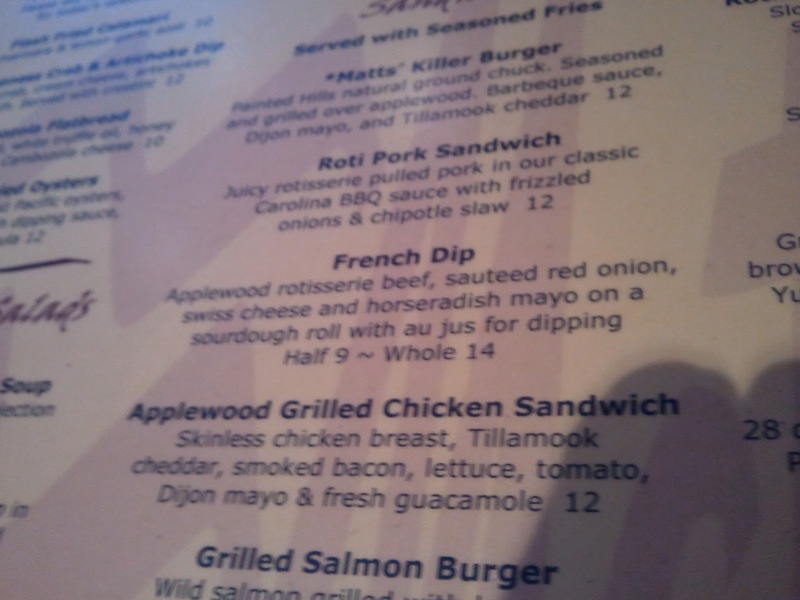 The sandwich overall wasn't that good and I'm giving it a generous 2 for its fanciness and fine bread. Overall Score = 2. Good bread but too dense, sour for this sandwich. Not juicy, chewy, crunchy, well done. Was fine, came out steaming, which is good. It's a gourmet dip with too much sourness and bitter, bad flavor. 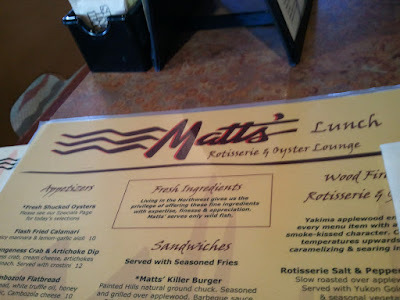 Reason to go back: Matt's has fun drinks, a good vibe, nice oyster selection, and a good happy hour.